Back in Mahers, Lake Oswego, OR - great to see "my gang"
Back in Bethany pub - they serve Feckin beer you know ! Dorothy firmly in control of our move... hahaha!!! Last month I'd finished playing (in all senses) in Hawaii and headed for San Diego then after a short stay (and the chance to sail my pal David's sail boat around the San Diego bay) we headed up the West coast to familiar faces and places in Portland Oregon. While I was in Portland Dorothy & I managed to meet up with good friends, have some fun and renew contacts with the Portland music scene. 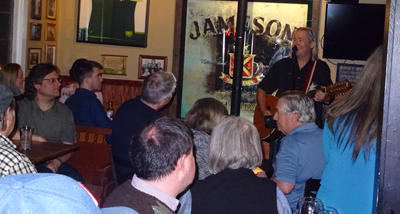 I played in Mahers Irish pub in Lake Oswego to a packed in crowd. They were all out to have a great time. It was a wonderful - I know so many people there - and know what songs they like. I was meant to stop at 11pm but I tortured them until 11:30 to get through all their favorites - ha-ha! That'll teach'em. 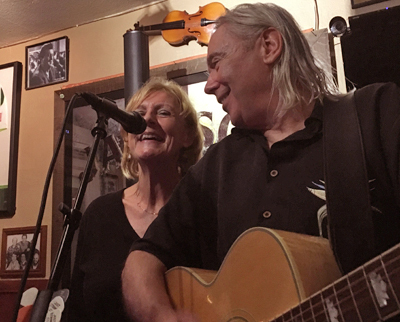 I also played in the Bethany Public House in Portland to a big crowd of folks who happen to like what I do - again, the reception was first class. I do love coming back to a place I've enjoyed playing and seeing people there who were there last time. It's even better when they wave goodbye promising to be there again when I'm back. I played so long Michelle (yes you) got tired ... I left the stage sweaty, happy - and needing my Feckin beer ! 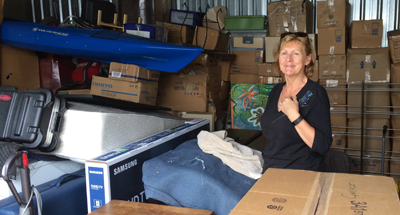 After the show on Saturday, Dorothy and I spent Sunday up in Vancouver, Washington having our worldly possessions manhandled (expertly) into a truck - all ready to relocate us to Florida. Wow! So, why Florida? With our son happily married in Wisconsin and our daughter happily married in Scotland, we were free to choose where we wanted to be - empty nesters with no nest. The thing is, I had promised Dorothy that after three years on the road, she could have a house again - the question was where? In all the places I've been in the last year, I have confirmed that I really don't like the cold, wet and rain and there are very few places where winter weather is nice. I also have found some great places to play in Florida (thanks to Derek Warfield of the Wolfe Tones). My shows are scattered around Florida, so why not live in the middle (close to the middle of nowhere) and then, would you believe it, we fell in love with a house six miles from Dundee Florida... Bingo ! so here we are! The traveling life has been pretty amazing, we've been in all but 3 of the 52 states in the USA (excluding drunken and exhausted). We've met so many great people (and some others!!) and love it when we get to meet up with folks like Anne and Marty who we first met in Lake Oswego, OR. Anne was the first person I've come across in my audience who knew the song and the words to "Tarriers" - an American song (that Danny Gibson used to sing) about the Irish and Scottish men who blasted through the mountains as they helped build the great US railways. We had a lovely walk and some great British Sunday bruinner together one Sunday in San Diego Brilliant! Cathi and Steve Behrens are great friends, they helped me settle into the music business in Portland, Oregon. A fan of Celtic music and culture, Cathi had asked about the story of the Gruffalo - and indeed, I was able to get the book when we were in Scotland. The version I gave her was written in Dundonian, the Scots dialect of my home town (known as Godsland). Naturally, we needed a dinner washed down with a wee bit (hahaha!!) whisky to facilitate the reading and translation of the book. Dorothy likes to get us to shows, roadie my stuff in and out of venues and let me be the designated drinker. There are, however, a few people (like Jan Aungier in Lake Oswego) who need a Dorothy rendition of "Flower of Scotland" to make the evening complete. Dorothy couldn't refuse. Sheer luck - I will be in Europe at the time of my pal Anthony's 60th birthday (what an old fart!). So I will be there in Waterford, Ireland to help celebrate. Anthony is the man behind the story in my song "Sausages for tea" - the tale of when Blarney United football team went off to Wembley to win the cup! With us going to Florida and being more established in general, Michelle my road manager has suggested she should desert me... well, that I don't need her any more. It's sad but true, my gigs are way more established because of Michelle - but I will always need her and her crazy family in my life. She's a grand wee Orkney lassie and I'm very thankful for her help getting me into some great places. Thank You Michelle! ...Venue owners around the USA can now relax ! Dorothy, Cathi and I - studying "Thi Dundee Gruffalo"
Flower of Scotland - Dorothy do your stuff lass! I'm looking forward to playing in Groningen, in the Netherlands. It is a University city, steeped in history and has a great cultural vibe (great food, drink AND old stuff - phew!). It'll be great - and we can visit Stefan and Sandra who were at school with our daughter, Valerie - woo-hoo! My big "Return to Portland, OR party" is at the Feckin Brewery on August 25th - this will be a Fecking great one for Pacific Northwesters to put in your calendars, we are planning a great Feckin evening with the Feckers. At the end of the summer I will finish off at the fantastic Galway Bay Celtic festival in Washington Oct 24 to 28th - the lineup for that is all but confirmed - and brilliant. Remember to get tickets early, or ye'll be fecked. 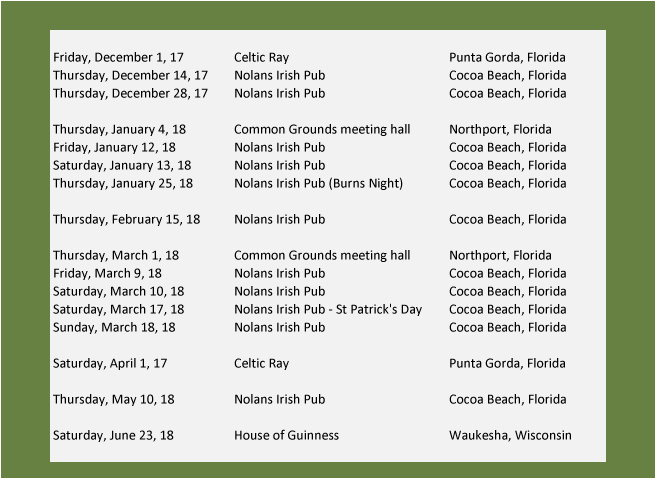 I'm trying to get ahead of the game for my return to Florida, I am delighted that I have a large number of shows in Nolans Irish pub at Cocoa Beach lined up (see below for dates). I'm also playing a show at a new place, for me, the Celtic Ray in Punta Gorda on December 1st, I've heard that it's a great venue. 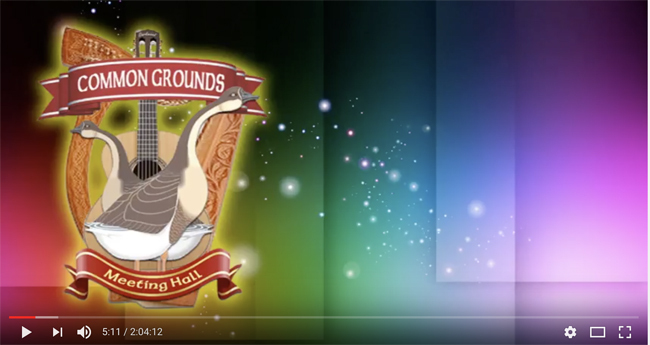 Talking of good shows - next year I've been booked for two live radio shows at the Common Ground Meeting Hall in North Port, FL with KDW Radio. We've put the two shows into a wee duo called "Coming and Going." The first one on January 4th 2018 will be a celebration of the coming of the New Year and the going of the old one, themed around my experience of New Year parties as a boy in Dundee (enjoying myself (and sneaking some beer) at the Gibsons). 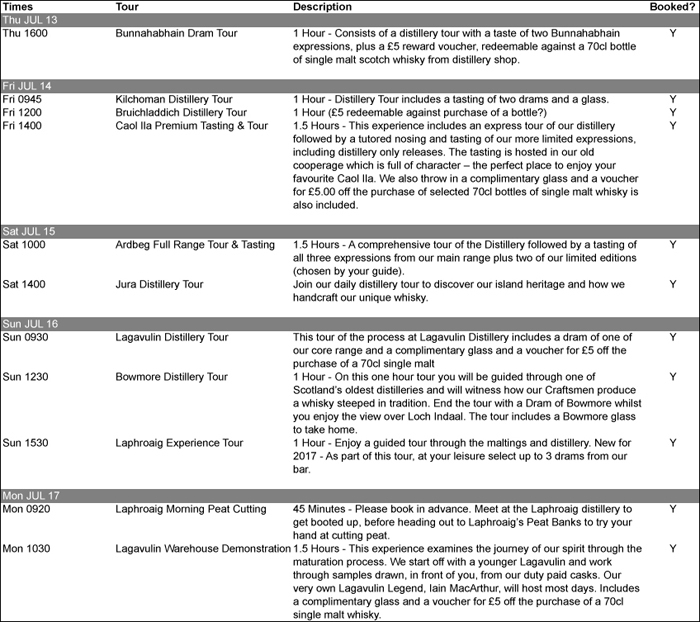 The second one will be March 1st as the lead-up to St Patricks day / week.. I will theme that around St Patrick's day including the differences in the way it was celebrated, in my experience, in Scotland, Ireland and the USA. Want to know what else I'm doing this summer ? Feast your eyes .... bwa-ha-ha-haaaaa !